Micah Fialka-Feldman, 21 years old, thrived in inclusive education from elementary through his high school years. He has a cognitive impairment and was supported by the general and special education staff, including paraprofessionals, peer tutors (LINKS), a Circle of Friends, and the use of creative modifications and accommodations in classes to meet his needs. He excels in the use of computers and uses both Screen Reader© and Dragon Point and Speak© (a voice-to-text program) to enhance his independence in learning and communicating. Some of his high school accomplishments included: Varsity Letter in Cross Country and Track, Member of the Homecoming Court, and the Social Studies Department Award for his civic involvement. 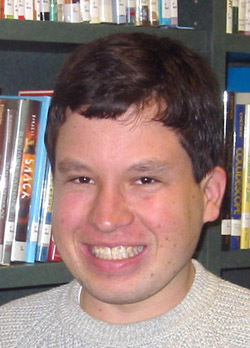 In 2004 Micah received the Michigan CEC “Yes, I Can” award for his self-advocacy. He was selected to attend the Michigan Youth Leadership Forum in 2001 and the National Youth Leadership Forum in 2002 (one of 77 youth in the country). He is a proud National Board Member of KASA or Kids As Self Advocates (www.fvkasa.org ). Micah has published articles and is a national speaker on inclusion and inclusive post secondary experiences. He has provided the keynote for several conferences including Tennessee 's State Special Education Annual Conference, Iowa 's Parent Educator State Conference, Michigan 's State Rehab Conference, and others. One of Micah's most remarkable experiences is learning on a college campus. Since 2003, he has been at Oakland University in Rochester, Michigan, while still being enrolled in public schools with an IEP. He sits in on classes, is a member of several student organizations, and volunteers at the Student Activities Center. To read more about his accomplishments, click on the articles listed below. “Micah, through a very well-organized Power Point presentation, "Watch out! Here I come?" beautifully, poignantly, and humorously conveyed a young person's enthusiastic journey to further his education beyond high school. To me, Micah embodies Kathie Snow's motto: 'When you see, meet, or think about a person with a disability presume competence.' I highly recommend Micah as a speaker or conference presenter." "Micah's session at the Maryland State Department of Education's Family Focus Conference Sunday Session at the Center for Jewish Education was a highlight of the day. Micah's tale of inclusion in public school and higher education was at once inspiring, humorous and sobering, revealing both the real life challenges and his many successes. He is a personable, self-assured young man, and an excellent advocate for himself and other individuals with cognitive disabilities. He answered questions from many parents, and showed remarkable patience dealing with some other individuals with disabilities. I would highly recommend inviting Micah as a speaker. Thanks again for all your efforts and dedication, and positive attitude." - New Guy On Campus: Special-needs student tastes college life in new inclusion program. Kids As Self Advocates: To learn more about Kids as Self Advocates, a national advocacy organization for and by youth with special needs, click here. Micah is one of the national Board Members of this organization. Micah's Web Site: You can view Micah's Web site here. Contact Micah: Micah can be contacted by e-mail at micahff@aol.com.